Just look at that creamy goodness! About 25 years ago I visited Minnesota for the first time. I was really excited to try wild rice soup since I had heard so much about it. While I wasn’t vegan back then, I was lactose intolerant. And I was so disappointed when I learned it was a cream-based soup. But it looked so delicious! I had major food envy. Thankfully, now I know how to make traditional creamy recipes dairy-free by using plant-based ingredients such as cashews. Wild rice is native to North American and grows in the cool waters of northern Minnesota. Technically a grass, wild rice is very nutritious. It’s high in fiber and low in calories. And it’s also a good source of protein, B vitamins, and potassium. Learn more by reading The History and Story of Wild Rice. 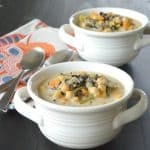 Now I can enjoy Vegan Wild Rice Soup whenever I want since it’s so easy to make in the Instant Pot! Do you have an Instant Pot electric pressure cooker? I highly recommend it! I bought mine many years ago. In fact, the model I have is the original version which has since been discontinued. But it still works great! I use my Instant Pot several times a week. I love it for cooking beans and grains. For example, I always use it for making quinoa when I want to make recipes such as Avocado Quinoa Salad, Quinoa Tabbouleh Salad, and Cilantro Lime Quinoa because it turns out perfectly every time. All varieties of rice cook perfectly as well, even wild rice! I regularly use it to make Wild Rice Salad with Apple and Pomegranate, Coconut Jasmine Rice, and Basmati Rice Pilaf. And you can also use to to make easy and healthy Instant Pot Mashed Potatoes. Saute onion, garlic, carrots, and celery in a little water. Add the uncooked wild rice, soaked dried chickpeas (garbanzo beans), vegetable broth or water, and some seasonings. Close the lid and set the manual function (pressure cook) for 25 minutes. Meanwhile, blend raw cashews and water to make cashew cream. 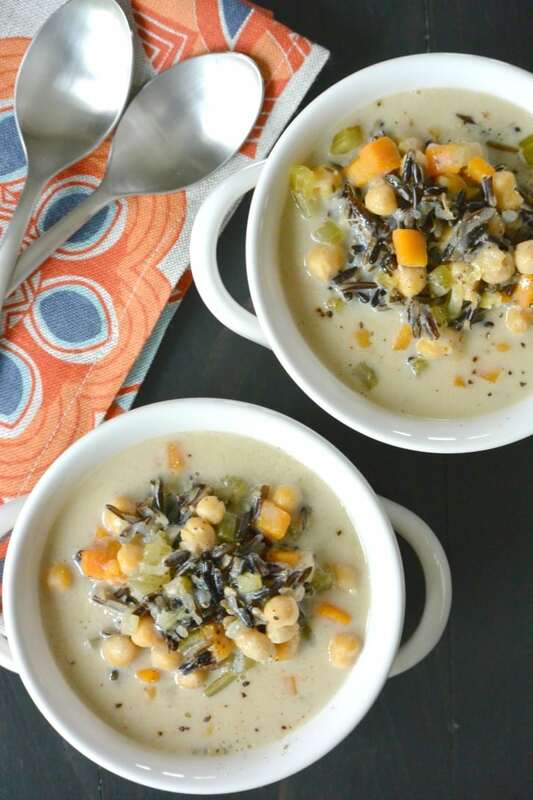 Add the cashew cream, salt and pepper, to taste, and enjoy your Vegan Wild Rice Soup! Plus you won’t miss the dairy or oil! And if you’re looking for more soups to make in the Instant Pot, check out the recipes for Indo-Chinese Corn Soup, Instant Pot Lentil Soup, and Vegan Potato Corn Chowder. 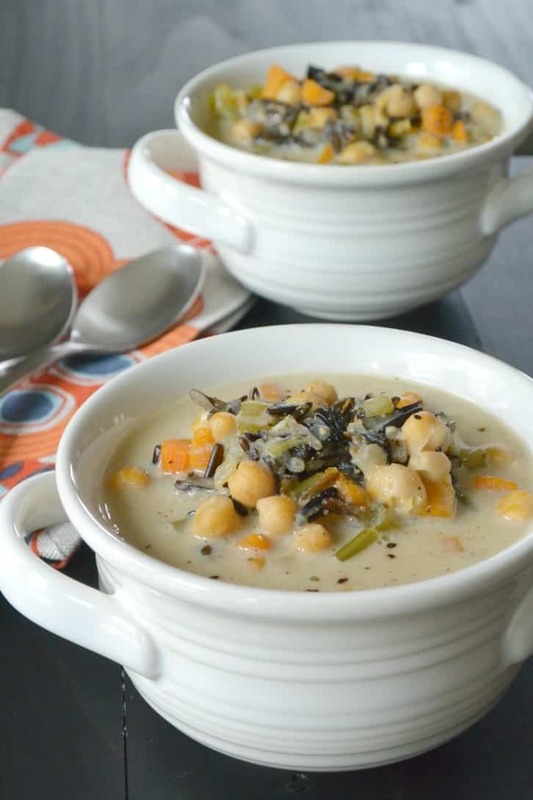 This soup is ready in less than an hour and makes about 6 servings. However, I’ve been known to eat more than one bowl at a time because it’s so delicious! I recommend soaking the chickpeas for several hours or overnight, but if you don’t have dried beans, you can add in canned garbanzo beans at the end as many readers have told me they have done successfully. If you have any leftovers, you can keep them refrigerated for a few days and reheat the soup on the stove or in the microwave. 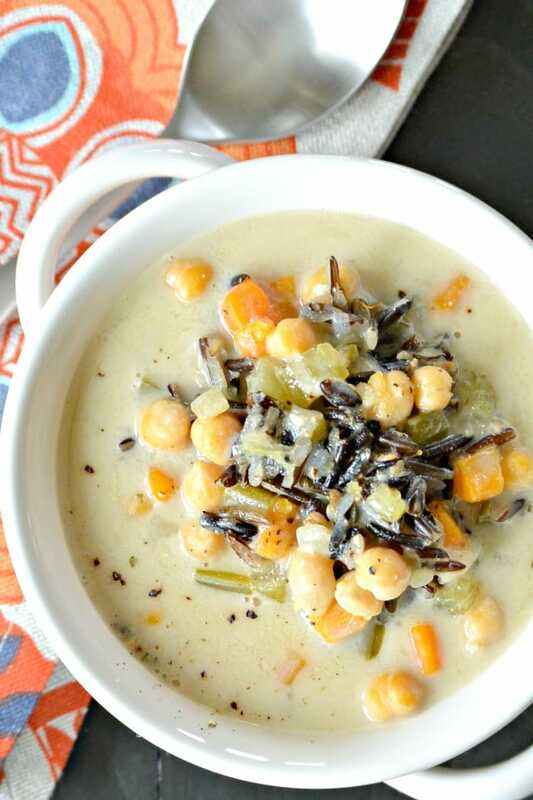 Vegan Wild Rice Soup is easy to make in the Instant Pot pressure cooker. 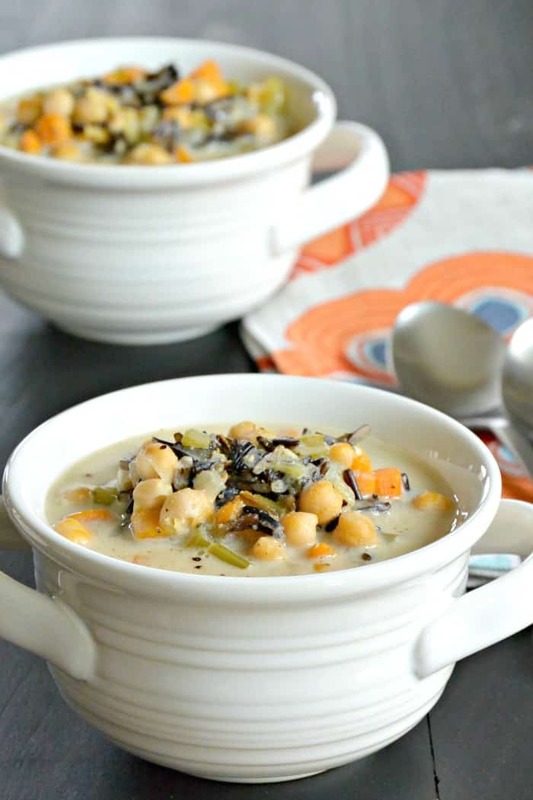 It's creamy and comforting while being dairy-free, gluten-free, and oil-free. Using the Saute function, saute the onions in a splash of water until they are softened and slightly translucent. Add the garlic and saute for about 30 seconds more. Add the carrots and celery and a few more splashes of water, as necessary, if the pot is dry. Saute for a few minutes until the vegetables are softened. Add the chickpeas, wild rice, bay leaf, thyme, and vegetable broth or water and stir to combine. Close the lid and set the timer for 25 minutes on Manual. Meanwhile, in a high-speed blender such as a Vitamix, blend the cashews and 1/2 cup water until very smooth. Remove the lid once the pressure has released. Add the cashew mixture and stir well. Add salt and pepper, to taste, and enjoy! Leftover soup can be refrigerated for a few days and reheated. Would like to try this soup, but I don’t have an Instant Pot. I could cook on the stove top or I do have a slower cooker. Do you have alternate instructions for someone who does not have an instant pot? Thanks. Looks delicious! Made it two nights in a row! Delicious . This soup is fantastic! I wish I could give it six stars. I used canned garbanzos rather than soaking the dried ones overnight, and the soup turned out fine. After it was made, we decided to try adding a little liquid smoke to each bowl as we ate it. The liquid smoke gives the soup a little of that ham or bacon flavor that we vegans secretly crave. Next time I’ll try, perhaps, a quarter tsp of liquid smoke when I make the soup. Don’t want to overdo a good thing. Cant wait to make it again. Thank you so much, Art! Great suggestion about adding liquid smoke! My husband and I both adore this recipe. My son doesn’t like chickpeas, so I subbed quartered mushrooms instead. That was fabulous too. Thanks for the recipe! I need to try it with mushrooms. I’m happy to hear everyone enjoyed it! Loved this! I did everything as written except that I cooked for 18 minutes on high pressure instead of the full 25 because I didn’t want the garbanzos getting too mushy. Will definitely make it again! This was AMAZING!!! I look forward to making it again. It was so creamy and comforting- and easy to make! I didn’t have dried Chickpeas, so I used a can of white northern beans- worked out great! I’ve made this twice and just love it! Thank you!